Taking care of yourself on the outside is incomplete unless you take care of yourself on the inside. This is one of the most important natural beauty tips. It is important to have a healthy diet with exercise added for good measure. This is meaningful beauty because all the bases are covered for optimum health and beauty. 1. 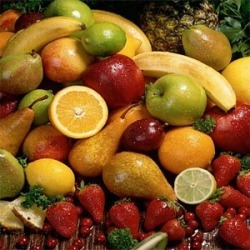 Eat plenty of fresh fruits and vegetables and try to cut out as much junk food as you can. Start slow by limiting it to once every week, to once a month, etc until you no longer have a need for it. 2. Add a multi-vitamin. It is very important to get nutrients from food and taking a multi-vitamin should never a substitute for food. 3. Drink at least eight glasses of water a day. 4. Daily exercise of at least 30 minutes is important for a healthy lifestyle. 5. If you smoke, quit! 6. Use sun protection of at least SPF 15 every day all year round come rain or shine. Having an adequate SPF should be the first anti wrinkle step to implement in your beauty regimen. A broad-spectrum formula such as Aveeno Continuous Protection Sunblock SPF 30 will help keep premature wrinkles off your face. 7. Get enough sleep. Eight hours is the recommended amount. Too much sleep or too little sleep is not recommended for a healthy lifestyle. Salmon ranks very high in the top beauty foods because it contains nutrients that keep the skin's outer layer soft and smooth. An added benefit are the omega 3 fatty acids in salmon that help to reduce cell inflammation levels that cause wrinkles and loss of firmness. It is preferable to get wild salmon as opposed to farm raised which are filled with antibiotics and tend to have more fat than wild salmon. They are also more susceptible to more pesticides. This calcium and zinc rich food is excellent to grow healthy nails, skin, bones and good posture. This is loaded nutrients and the lutein content ensures that spinach will keep eyes healthy. It is best to get organic spinach because this is is one of the vegetables for which pesticides can not be removed by washing so get organic spinach. Blueberries are packed full of antioxidants and anti-inflammatory properties which is great to help protect you from premature aging. One cup of blueberries is about 80 calories which is slimming in addition to providing dietary fiber as well as protecting you from other diseases. It is also best to get organic blueberries since pesticides can not be washed away if you get blueberries that are not organic. A glass of red wine contains some of these antioxidants. This fruit also contains anti-aging antioxidants, vitamin C, and other nutrients that protect the body from disease. Various nutrients in these nuts lead to smooth skin tone, strong bones, healthy hair and vibrant eyes. Doesn't everyone with a sweet tooth love that this is in the beauty diet list?? I know I do. This also contains anti-oxidants that rid the body of free radicals that damage cells and cause premature aging. Dark chocolate has so many other benefits such as protecting the skin from sun damage. improved skin hydration, etc. These are excellent because pesticides can be removed unlike regular potatoes that are not organic. The orange color means that they contain beauty enhancing beta-carotene. This anti-oxidant gets rid of free radicals that are damaging to the cells and prevents premature aging. Beta-carotene is converted to vitamin A which is great for healthy skin. We have all been told that in order to lose weight, we need to reduce or eliminate the amount of fat in our diets which causes us to think that all fats are evil! This is not true. By reducing or eliminating fats from our diets, it only causes us to lose our fat enzymes that help to burn fat. When this is lost, we will not see any progress in our exercises when we try to burn fat. It is important to know that there are certain fats that need to be eliminated and certain fats that need to be included in our diets. 1. Trans Fats - These are included mainly in processed foods. Read food labels to ensure that purchases do not contain trans fats. Trans fats are detrimental to the heart and your health. These should be eliminated totally from your daily caloric intake. 2. Saturated Fats - These are found primarily in dairy and meat products. These should be limited but not quite to the extreme of trans fats. These cause an unhealthy build up of cholesterol. Baked, fried and processed foods are also a major culprit. The American Heart Association recommends that saturated fats should only make up about 7% of your daily calories. 1. Polyunsaturated Fats - These are the essential fats that include omega-3 fatty acids (found in Mediterranean diets) and omega-6 fatty acids that are found in standard Western diets. Only omega-3 acids promote fat burning. Since the western diet contains more omega-6 fatty acids, the brain tells the body to hold on to the fat and not to engage in fat burning. Polyunsaturated fats are found in fish (especially salmon), walnuts, soybean oils, etc. 2. 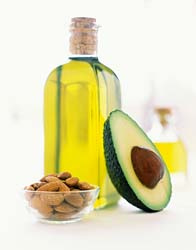 Monounsaturated Fats - When these replace saturated fats, they can help lower cholesterol levels. This reduces the risk of fatty acid buildup in the artery walls which cause heart disease. Increase these monounsaturated fats in your diet to promote heart health. These healthy fats are found in most nuts and seeds, avocado, olives, olive oil, etc. Increasing healthy fat intake should be easy. Saute vegetables with olive oil, have oatmeal for breakfast and stir in some flaxseeds, make a homemade vinaigrette using olive oil or canola oil, add avocado to a salad, etc. It is not complicated. Your body and your heart will thank you for it. Increase your healthy fat intake which will increase the length of your workouts and your metabolic rate and help you burn more calories and fat. Let this be the day that you take control and create the body of your dreams following a healthy diet and exercise.